The Juki arrived back the Friday before Thanksgiving week. My gardener (and general helper/builder/handyman) was able to come over and help me lift it back onto the table on Monday. He had helped me with the original set-up and so I was very grateful that he was able to come and help me get it back in place. 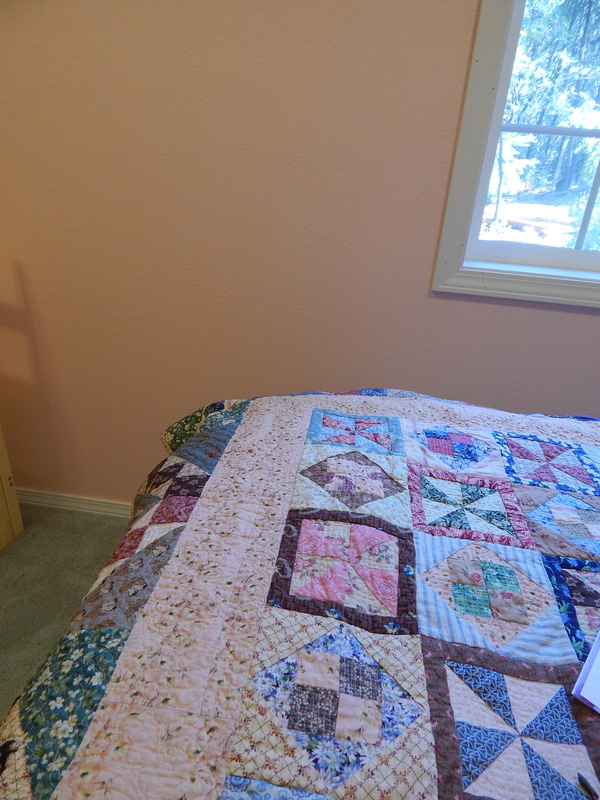 I was unreasonably nervous about working with it, and so I planned to practice on a couple of small quilts before attempting the quilting on Hallelujah! 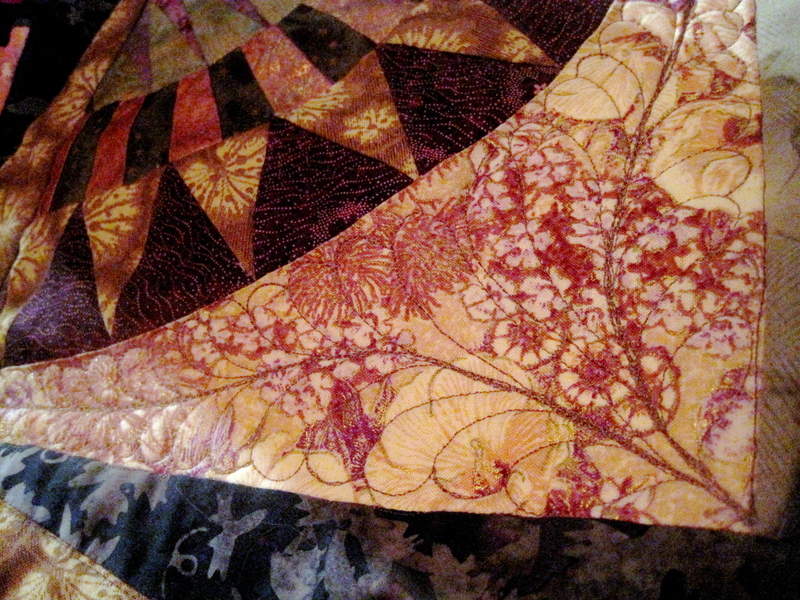 First, I finished the quilting on this little piece. This was made of some very small courthouse steps blocks I had made. I enjoyed making them, but after getting this far, I realized that I was never going to finish enough of these blocks (with 1/2″ finished logs) to make a whole quilt. I always loved this verse, and thought it was the perfect one to go with “courthouse steps” blocks. 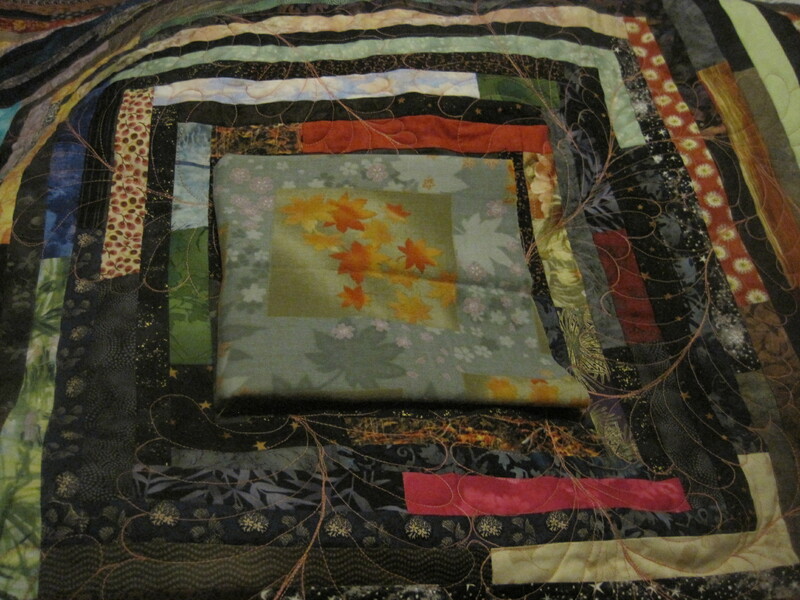 Next, I dug out a really old little quilt. A long-gone dog had chewed on the edges, and I didn’t know what to do with it. Then when I looked at it again, I realized I could just cut the borders smaller, and no one would ever know a dog gnawed on it 🙂 I had fun quilting it. So I was almost ready to start Hallelujah! 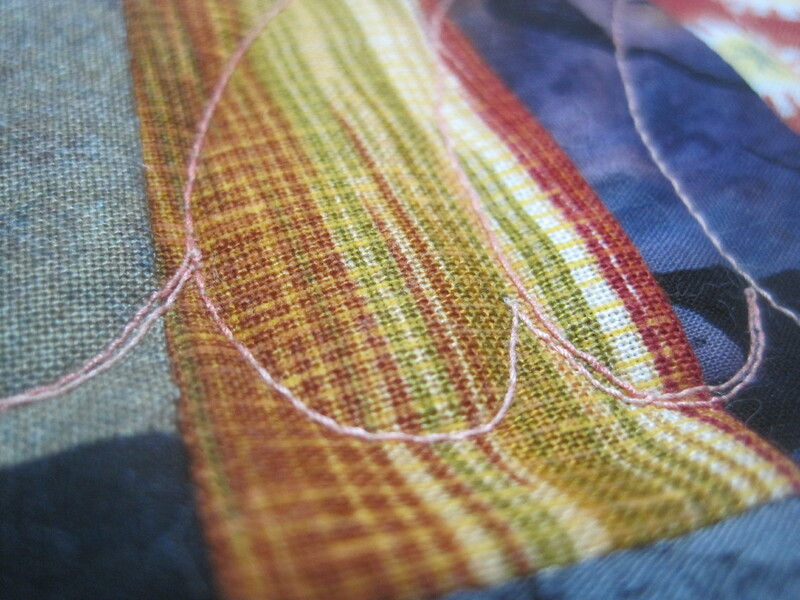 But I decided I wanted some different thread for quilting. I decided to treat myself to a trip to the quilt shop after the last shot in my knee, the day before Thanksgiving. Because I was determined to start this quilting the day AFTER Thanksgiving. Look at this wonderful fabric I found at the shop! I could not resist getting a piece of it. And right on time, Friday morning, I made myself go out into the studio, I practiced a feather or two on a practice sandwich, and then I just went to town. I alternated outlining the lettering with making feathers. Next I am going to fill in between the feathers with some crosshatching and some pebbles. 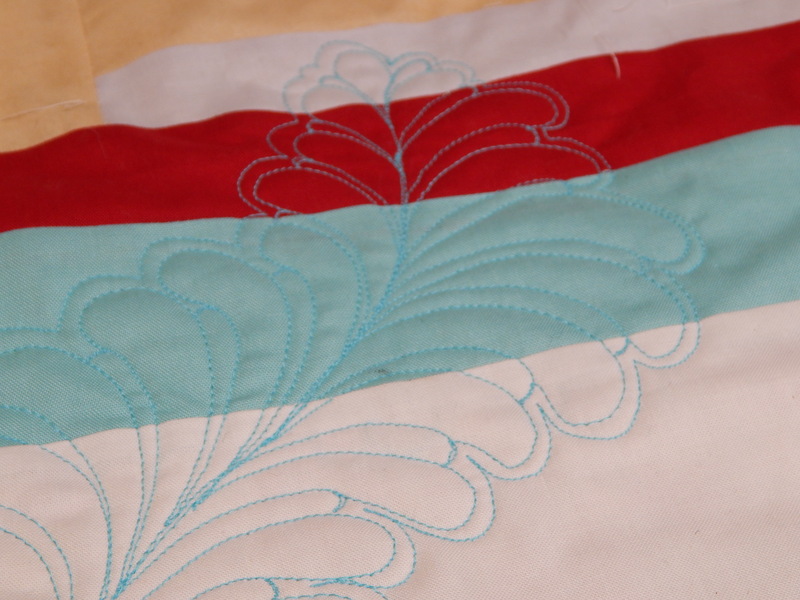 I’m not sure what I am going to do around the lettering–thinking about some straight line quilting just to make them stand out. 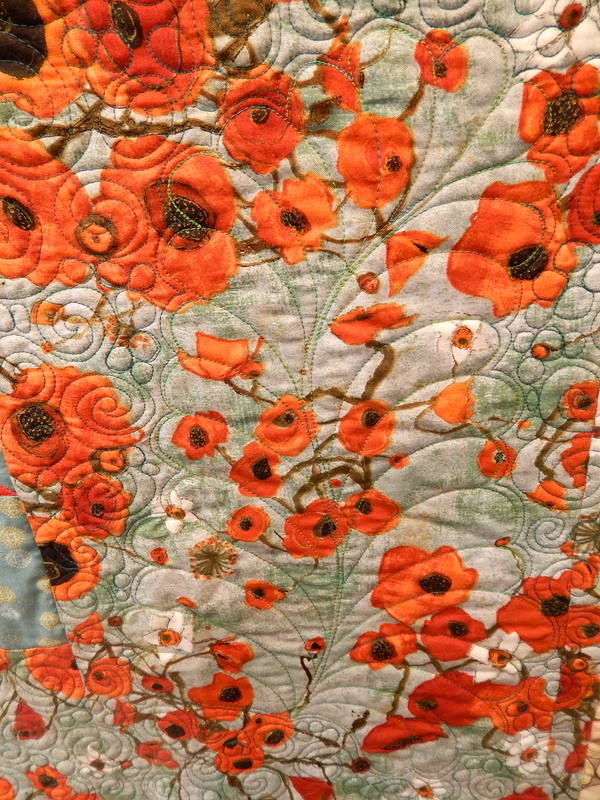 I was supposed to give you a code so you would be able to watch my episode of The Quilt Show yesterday. There is a little delay in getting this code from The Quilt Show, but as soon as I get it, I will pass it along to you! In the meantime, you could do the puzzle they made out of my quilt “After The Wedding.” Choose the 100 piece NON-rotating–its fun! I started the piece with the feathers. 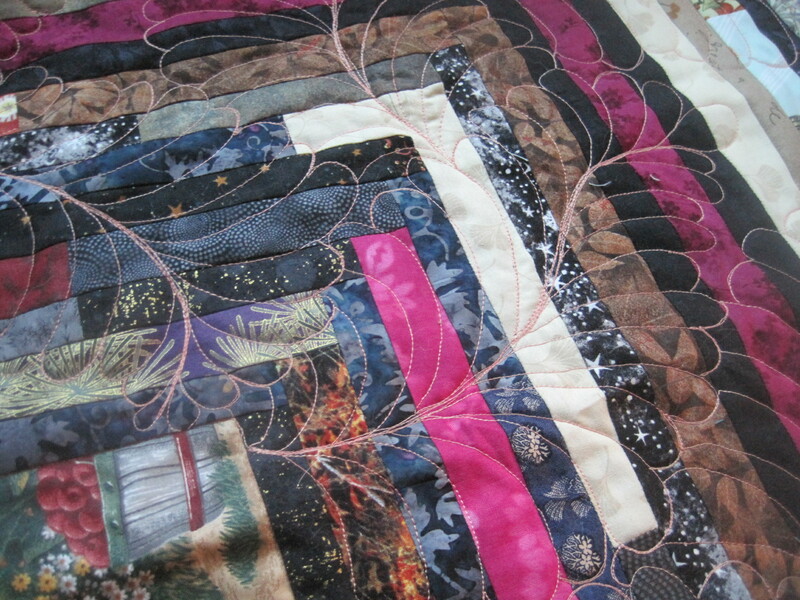 I have to admit, its more fun to think about feathers than to actually quilt them. 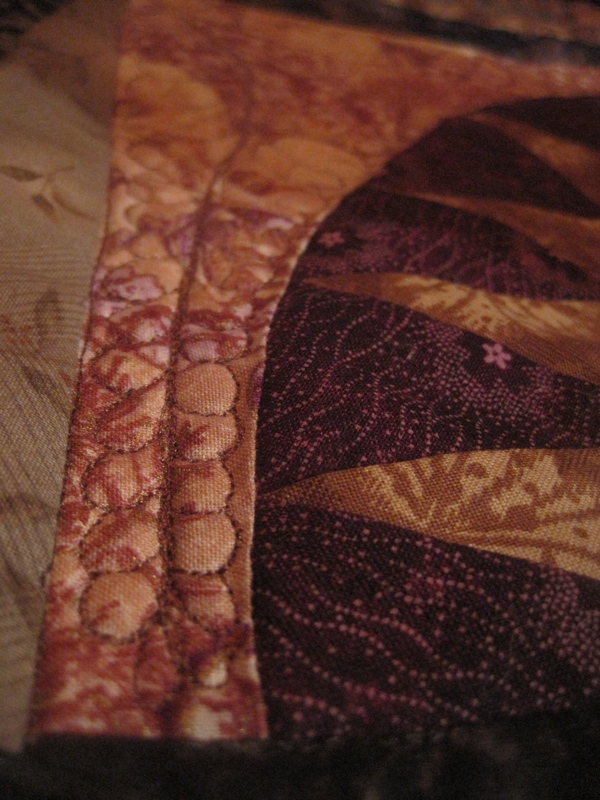 With quilting the feathers comes the angst of what do I put in between them?? Thanks so much for the nice comments and positive response to my new blog! 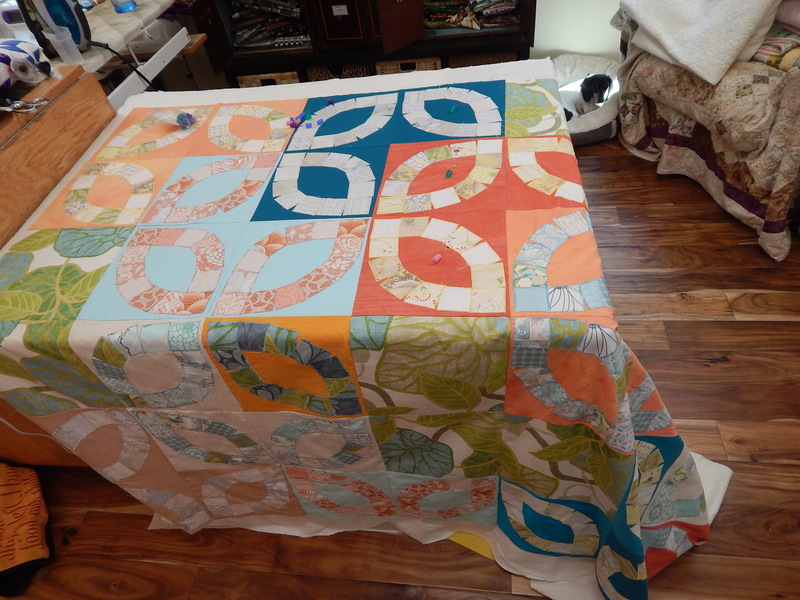 To answer KC’s question–Yes, you can use the ironing board/steam method for handquilting. 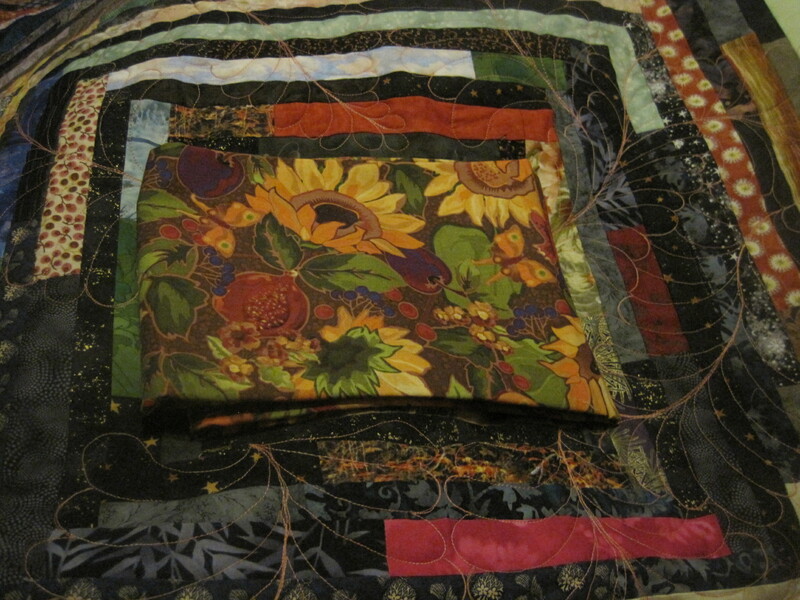 After I steam the quilt sandwich, I just take it to the sewing machine and machine baste it in about an 8 inch grid. 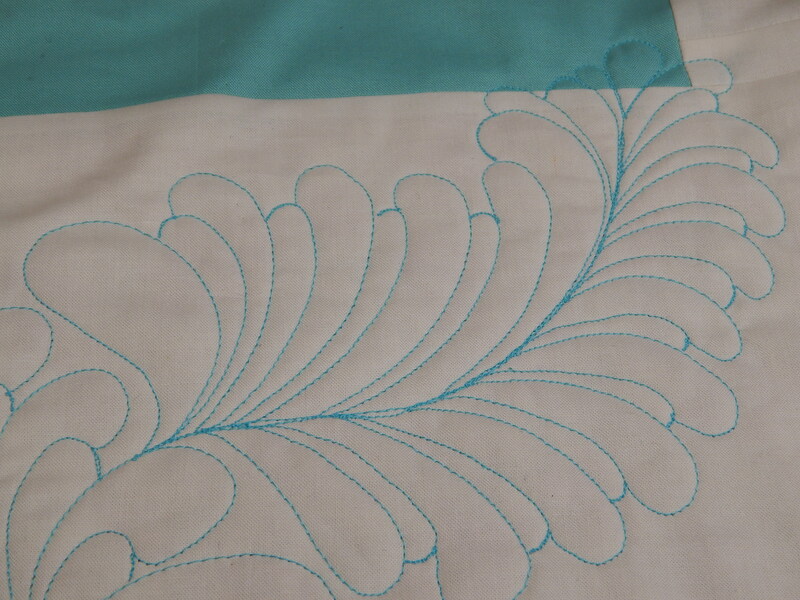 I set my sewing machine on the slowest speed, and make big stitches–probably 3/4 of an inch, so its pretty easy to remove them as I go along. 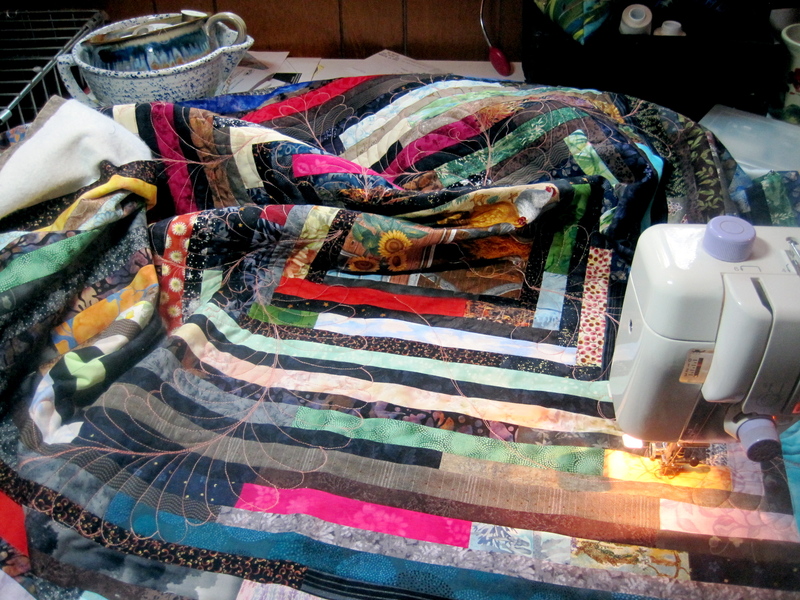 I don’t use a hoop or a frame when I hand quilt, and this method keeps the layers very stable. 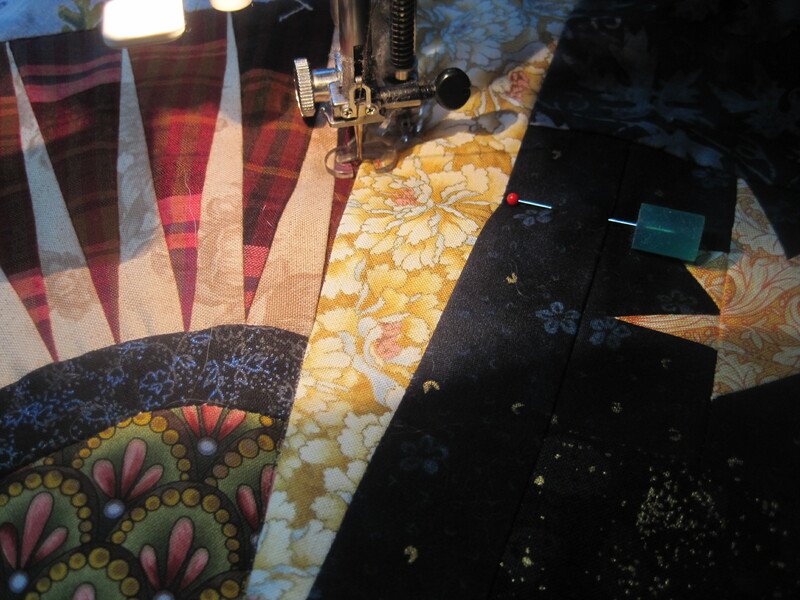 Most of the time I am hand quilting a larger quilt–like full or twin size. 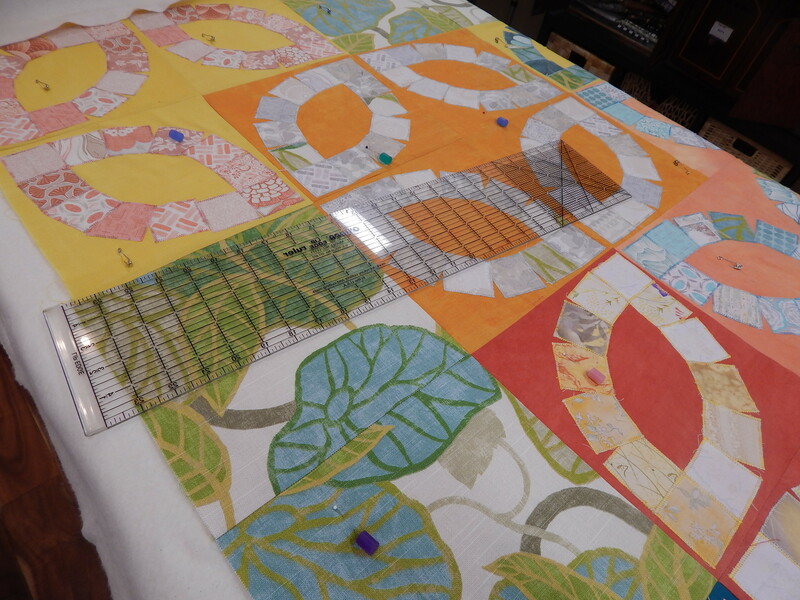 So I thought I’d just share with you my thought process in changing something I didn’t like in a quilt. 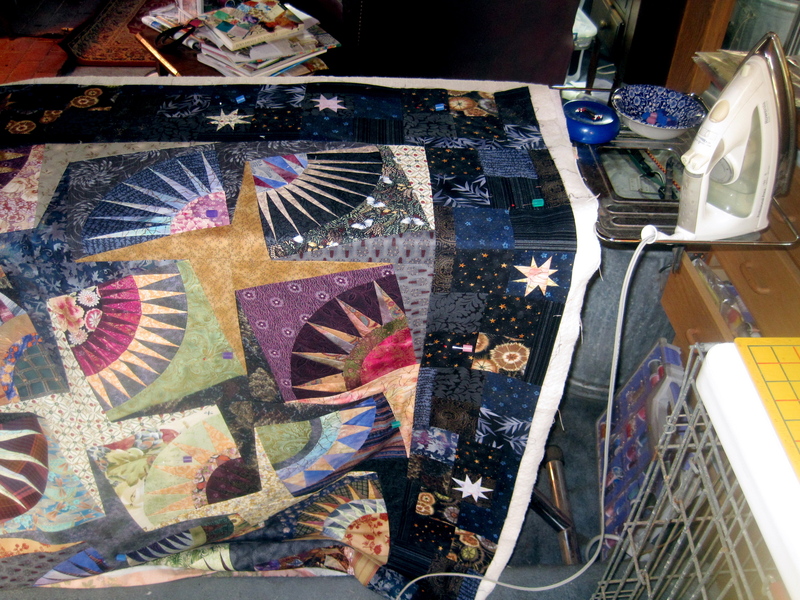 That quilt with the concentric strips that I was quilting feathers on? 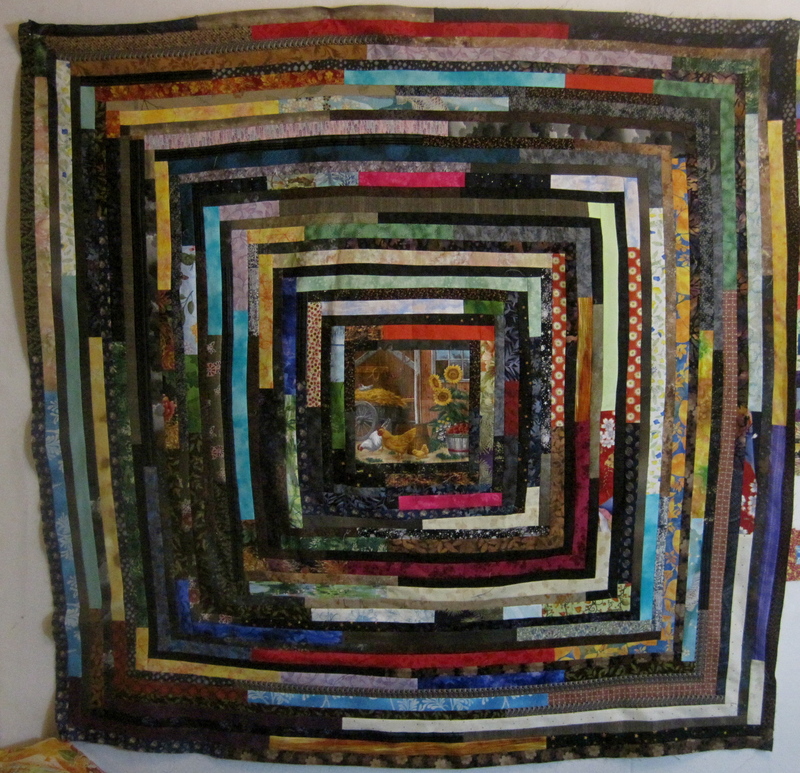 Well, my main reason for making that quilt was that I had seen a small picture of an antique quilt with concentric stripes that really intrigued me. In the antique quilt I think the center square was probably just a four inch red block. But I thought, why not put something more interesting in the center? 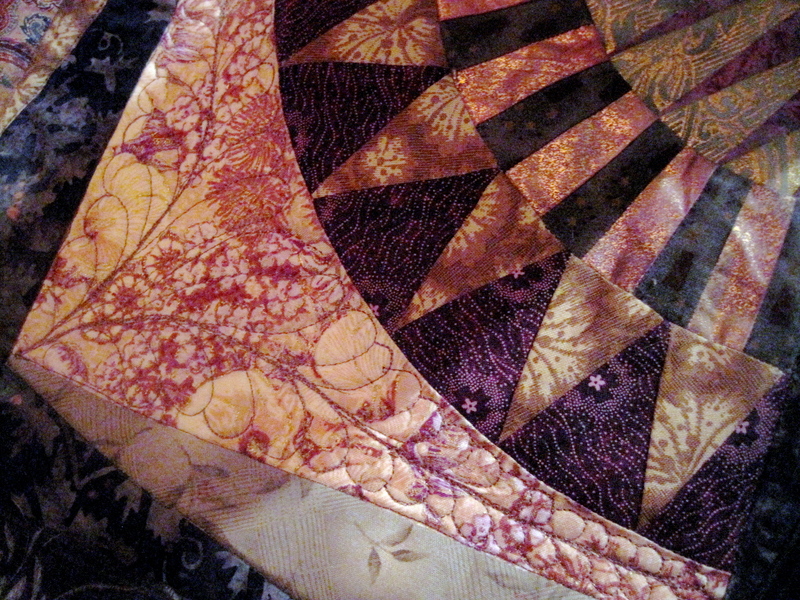 I didn’t want the center to be the focus, but I did think it would just make the quilt more interesting. 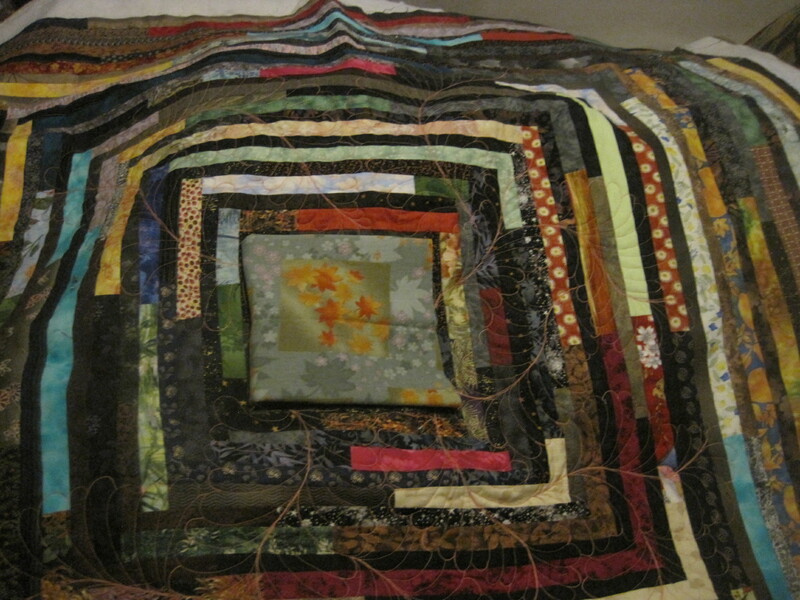 And of course I had grand ideas of making hundreds of these striped quilts, each with a different interesting center. Ha! Its a little monotonous making concentric stripes. And also more and more difficult to keep squared up, as you will see in the first picture. Anyway, I didn’t put much thought into what I chose for the center. I like chickens, so I chose a chicken print. When I showed it to my BFF, she said “I really like it except for the chicken center.” Harumph. I liked the chicken center just fine and that was all that mattered. When I got it out almost a year later to start quilting it, I looked again, and thought the chicken center was just fine. Then when I put the feathers around the center, and took some pictures I thought Ruh Roh. That doesn’t look very good. The feathers added some elegance to the concentric stripes, and that homey chicken picture didn’t fit anymore. So I am going to replace it. Thankfully, I didn’t quilt the chicken center. 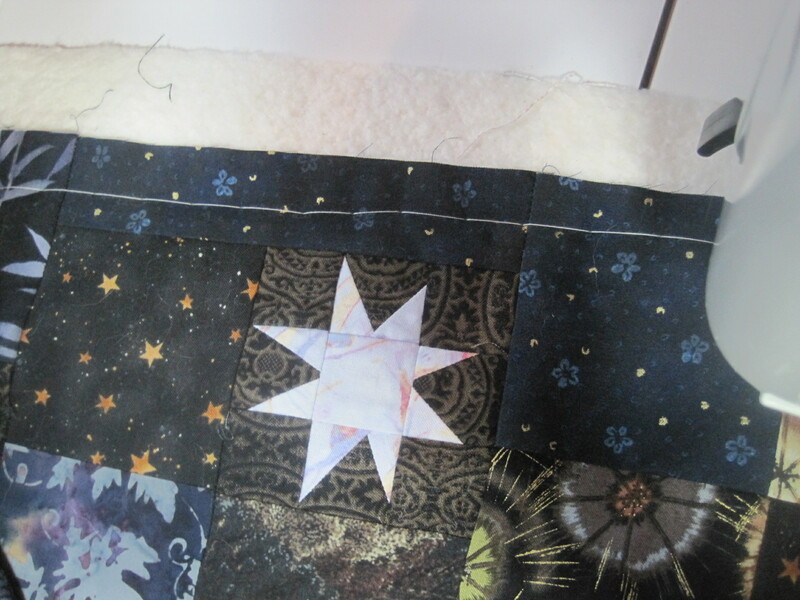 So I will just carefully cut it out, and then applique a new center in its place. I might use a little fusible around the edges if I think its necessary, but I don’t think I”ll have to do that. I don’t like fusible that much. 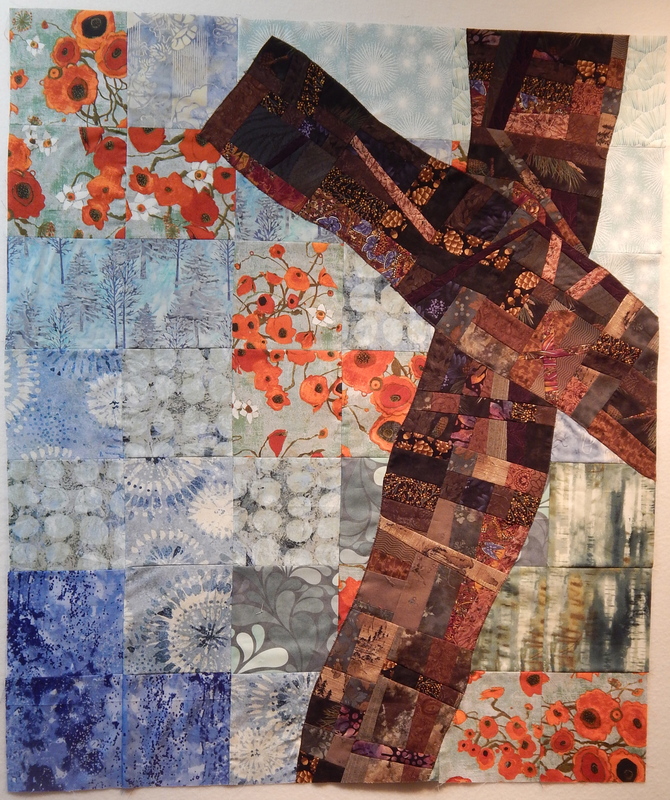 Speaking of fusible, and this is totally off-topic, Melody Johnson is a quilter who has made a career out of making fantastic art quilts that are entirely fused, and she has a beautiful blog that I enjoy every day. 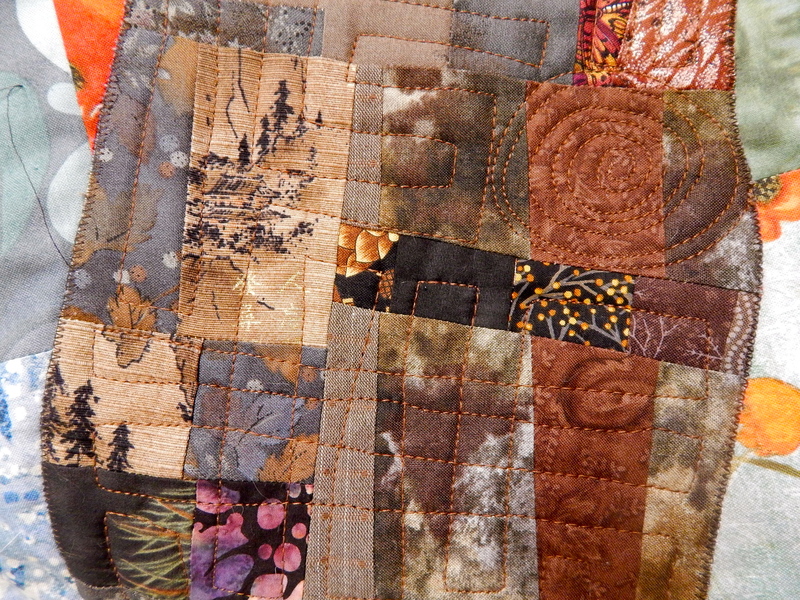 She is doing a ‘quilt along with Melody’ this month. So far, I’ve just been watching, but I might jump in and fuse a few things. Goodness knows, I’ve got more than my fair share of fusible web around this place. First I tried this understated oriental print. Pretty. My BFF liked this sunflower print because it was the most vibrant. 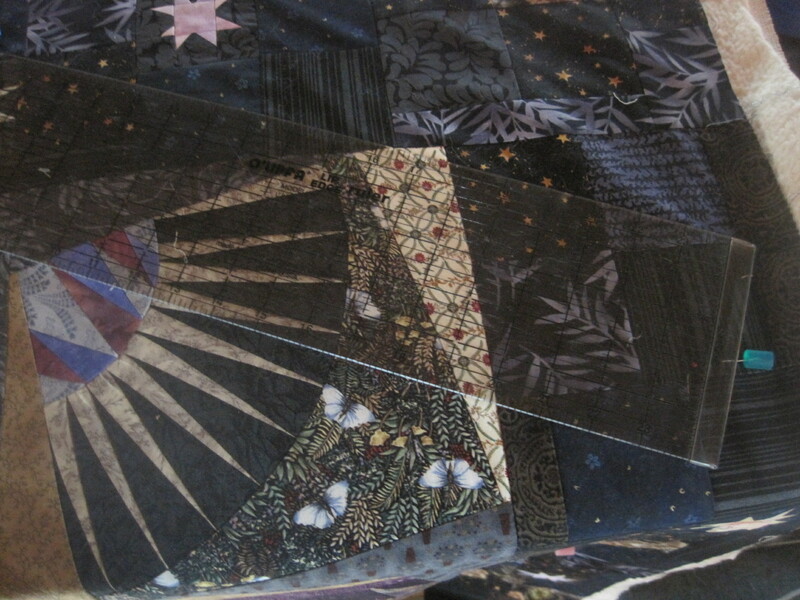 I am surprised at myself, but I kind of like this oriental print the best because it is understated, and the concentric stripes are still the ‘star’ of the quilt. What do you all think? You can tell me the truth. As you can see from my interactions with my BFF, I still pretty much do what I want to do! I got a new kind of thread to try today–trilobal polyester. 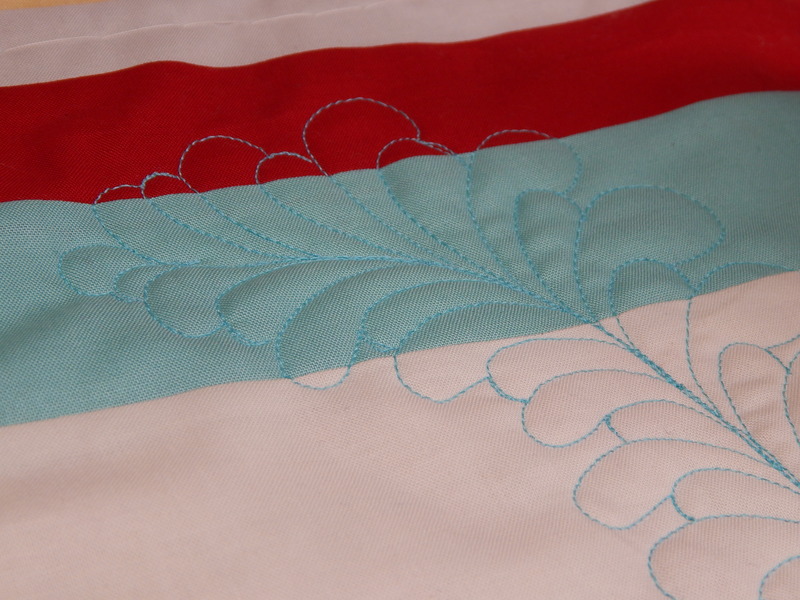 BFF has been using it (she is a professional long arm quilter) and she really likes the elegant sheen it adds to a quilt. 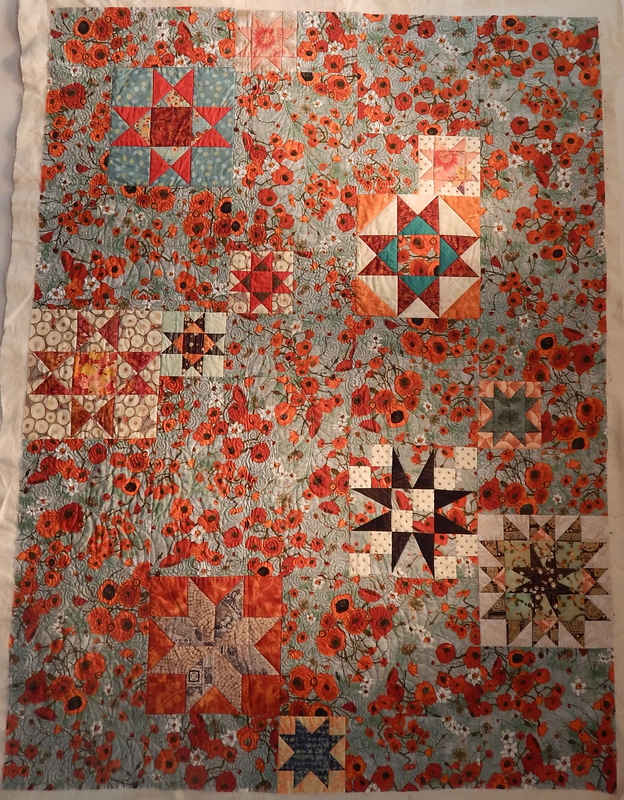 I thought it might work good on the New York Beauty quilt. 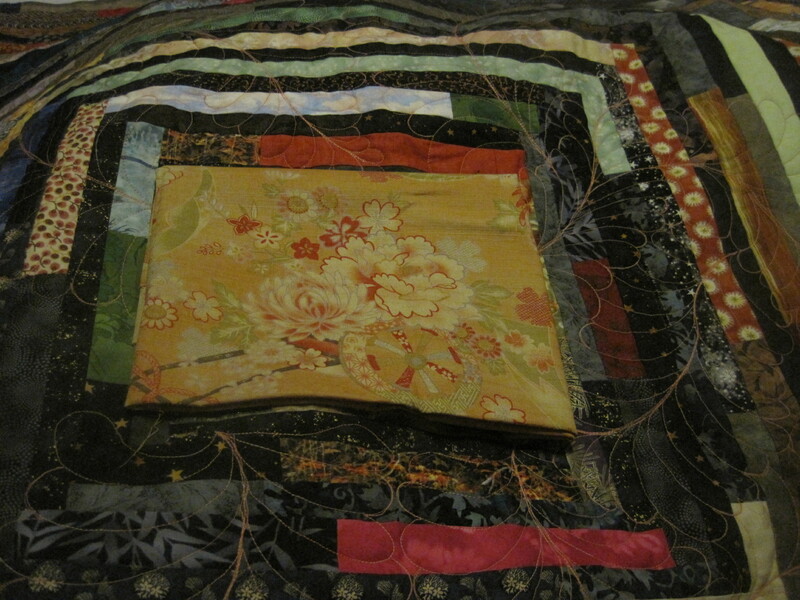 Most of that quilting I am doing in the ‘ditch’ so it doesn’t show much. 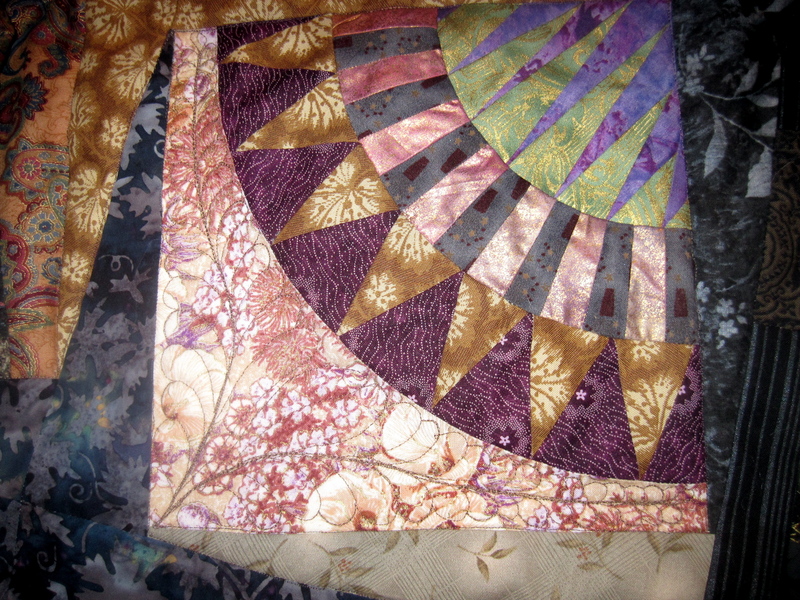 But in the arcs and wedges I will do a little quilting that shows. On paper, I’ve drawn several possibilities for filling in the space. One of the things I tried was filling in the space with feathers. So I had to try out the new thread as soon as I got home. I really like the way it looks, although these pictures don’t show the sheen of it too much. Once you get the hang of these feathers, it is amazingly easy to fit them in almost anywhere! So I’ll say so long for now. There’s still a little time to take a few stitches before going to bed!